The Manhattan Beach City Council on Tuesday night approved a final design for a new Roundhouse Aquarium and an initial design for the Scout House, two public-private partnerships that each will restore vitality to the city’s most historic remaining infrastructure. Many of those who spoke Tuesday night, including Councilman Richard Montgomery when he made the motion to approve the final design, did so with watery eyes. Local Realtor and surfer Bob Sievers, whose son played baseball with Harrison, said his passing hit his family especially hard and that the revived Roundhouse thus carried special meaning. 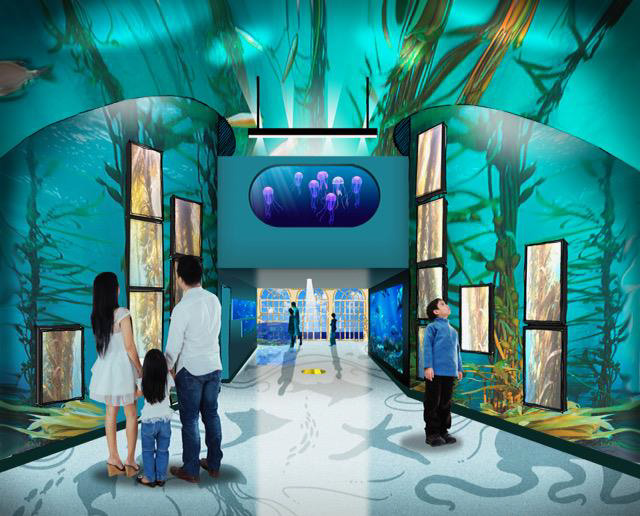 Cambridge Seven architect Peter Sollogub, who has designed major aquariums throughout the country, gave a virtual tour of the redesigned 2,000 sq. ft. facility, which includes a new eastern-facing entrance where the snack shop now exists. Once inside, aquarium visitors will find themselves in a widening walkway, with a rocky reef tank, a sandy bottom tank and the ever-popular kids’ touch tank on the left and the shark tank on the right; the west-facing walls retain the Roundhouse’s distinct arched windows, and so the Pacific is always visible — Sollogub described how the space opens up towards the ocean as a “celebration.” Above, an updated and enlarged mezzanine includes a goldfish tank, an exhibit space, a discovery corner “nook” for small children, and a view of the touch tank from above. The only hesitation anyone expressed was the departure of the snack bar. But the most recent vendor, Two Guns Espresso, as well as former vendor Dana Ireland and restaurateur Mike Zislis, all suggested the roughly 165 sq. ft. space was a difficult business proposition and unnecessary for the pier given all the dining options nearby. Ireland, the only of the three present Tuesday, argued it made no sense, design-wise, to have a world-class aquarium with an entrance from the south. “The cafe does need to go,” he said. Manhattan Beach Chamber of Commerce CEO Mark Lipps offered an alternative. Mayor David Lesser and Councilmember Steve Napolitano both said they had been reluctant to part with the cafe but were persuaded by the former vendors testimony and by the benefits of the new design itself. Montgomery’s motion to approve the design passed 5-0. Pending Coastal Commission’s approval, expected in September, construction will occur from January to May and the new facility will open in June of next year. A temporary trailer will house a small version of the aquarium, and portions of the pier will be closed for two months during construction. Michael Greenberg, who donated $1.25 million to start the project, said a total of $2.5 million of the overall $3.5 million has been raised to pay for the project. The Scout House is a somewhat less iconic city facility, but one that is equally treasured by several generations of Boy Scouts, Girl Scouts, and senior citizens. The facility, also known as the Manhattan Beach Senior & Scout Community Center, is tucked away amidst the trees behind the Joslyn Center on Valley Drive. It was built by the Boy Scouts and their supporters in 1952 and has barely changed since, except by way of slow deterioration. A few years ago a non-profit, Friends of the Senior and Scout Community Center (FoS&SCC), formed in order to raise funds to rebuild the aged facility. On Tuesday night, they unveiled the initial design by local architect Louie Tomaro, and outlined where things stand with fundraising. Bret Bernard, a board member for the nonprofit, noted how heavily used the facility is, given the 1,500 scouts and nearly 10,000 seniors (35 percent of the city’s population) live in Manhattan Beach. “It’s a perfect partnership — seniors by day, and scouts by night,” Bernard said. He also noted the Scout House’s larger historical significance — the year after it was built, the Scouts hosted the world’s first Pinewood Derby, a model car race which has since been adopted by scouts worldwide. Tomaro unveiled his initial design, a two story, 7,000 sq. ft. building which features movable walls to maintain flexibility for large and small events, an outdoor amphitheater and BBQ area, and a second story nestled in the trees. “The concept was really to make this feel like it’s a treehouse, almost,” Tomaro told the council. Napolitano asked if it could be made to “look just like a cabin” and Tomaro said that was the idea, stressing that initial renderings focused on building massing rather than materials. Beth Gessner, the vice chair of the Friends of the Scout House board, said the building was originally slated as 6,000 sq. ft. at $2.5 million but has been expanded to 7,000 sq. ft. and about $3.5 million. She said $1.3 million has thus far been raised, and the organization is recruiting volunteers to kick its capital campaign into high gear in September pending council’s approval. Part of the increased cost, she noted, was the addition of an office space for a full time city presence and outdoor restrooms, which will serve athletes from nearby Live Oak park. She asked the city for a $82,000 contribution. Napolitano surprised her with his response. The rest of the council, including former Girls Scouts Amy Howarth and Nancy Hersman and former scout leader Lesser, enthusiastically agreed. They added a stipulation that the building should be equipped with solar panels. The initial design passed unanimously. “The big problem with this project is it’s going to make the Joslyn Center look even worse,” Napolitano joked, triggering a discussion about adding the facility to an upcoming capital improvement analysis. Howarth, after both the Roundhouse and the Scout House were approved, could barely contain her giddiness. For more information see www.thescouthouse.org and www.roundhousebeautification.com.